Posted September 1, 2009 by Norburn Lighting and Bath Centre & filed under Kitchen & Bath Plumbing, Kitchen Sinks, New Products, Trends . Each PRECISION MicroEdge sink offers a choice of sink with faucet ledge or sink without ledge–a more minimalist look. Handcrafted in Germany of premium stainless steel, these sinks reflect the finest skilled craftsmanship and quality in a kitchen sink today. 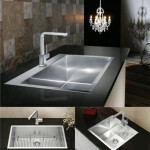 All MicroEdge sinks pictured are shown with BLANCO SILHOUETTE faucet. Custom accessories, including sink grids as shown above, are available.